I’ve got a client…. 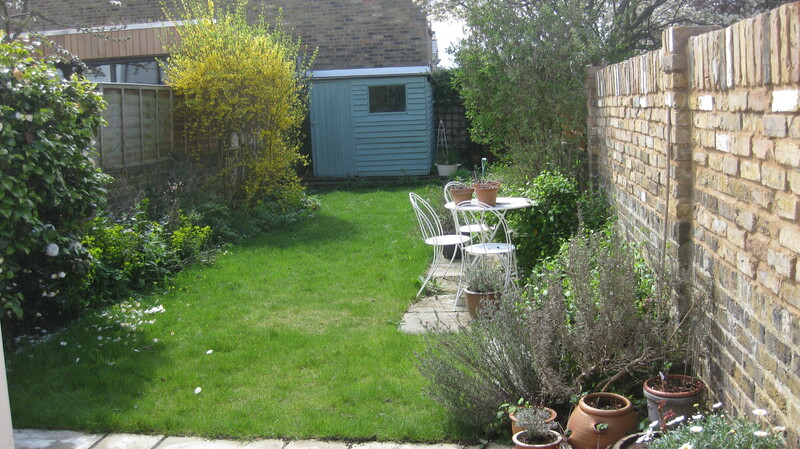 a real client… a client with a garden…. a client who wants me to come up with a design for her garden. I AM BEYOND EXCITED……..
A couple of weeks ago I went to a terraced house in Hampton Hill to meet its owner Jill Watson. Jill is a good friend of my good friend Hilary. Jill wants somebody to help her turn her garden into a space that lives up to the inside of her house. And the person she wants to help her is …. ME. It feels like this job is made for me. I know this part of the world really well – Jill’s house is only a mile or so away from the house I lived in when we were first married, the house where my son James was born. And it’s just up the road from Hampton Court where I’m doing my course. And Jill’s house is lovely – inside it feels airy and spacious with a real sense flow. The materials used are beautiful, the colours restful and welcoming. The garden is south west facing and – on Friday morning in the spring sunshine – surrounded by trees bursting into blossom. So here goes. New career here I come.